This low volume stock could be one to watch as it ran up before earnings and after releasing them today it’s held it’s ground. I like this breakout with the strong move and if you are one to trade lower volume equities then this could be for you. I’m using an intraday 60 minute chart to show that even though it’s corrected off the highs in what would seem like a big move, it’s really not. 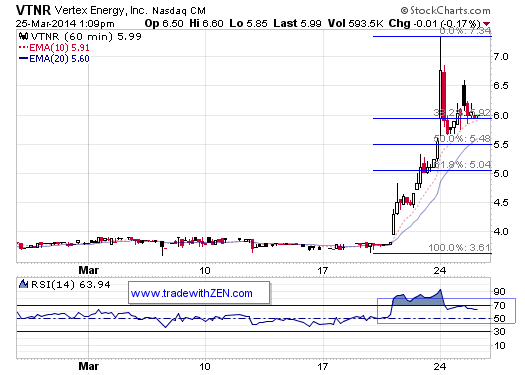 What this stock is doing is correcting intraday and removing any real overbought state during the trading session. I actually think based on how it’s trading it’s already corrected enough intraday that this could keep going higher. If it does have one more push lower then I think $5.50 could be the low before it moves higher. Vertex Energy, Inc., an environmental services company, provides a range of services designed to aggregate, process, and recycle industrial and commercial waste streams, as well as off specification commercial chemical products.